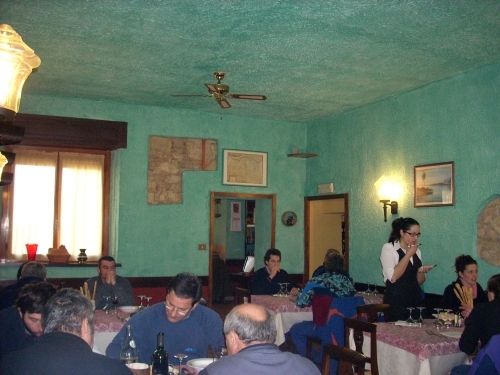 Podere Casale does not offer restaurant services. It is possible to have lunch or dinner at the Antica Trattoria Del Tempio right next door to our Estate. In this warm and characteristic family run restaurant, you will be welcomed by a young dynamic couple who will offer you a wide selection of the traditional Colli Piacentini cuisine. An absolute must pisarei e fasò, pancetta and coppa piacentina, meat and game and torta sbrisolona for dessert. The wine list offers a wide selection of DOC Colli Piacentini Wines including our Gutturnio Superiore, Sparkling Gutturnio, Ortrugo and Malvasia. We have been collaborating with Trattoria Del Tempio for many years. Make sure to qualify yourselves as guests of Podere Casale to take advantage of the special conditions reserved to Our guests. Antica Trattoria Del Tempio is situated in Via Creta, 6 right in front of the flight of steps leading to the 18th Century Parish Church dedicated to San Colombano where it is possible to admire a portrait of the parmigiano Francesco Scaramuzza. Trattoria Del Tempio is closed Wednesdays and Monday evenings. Reservations are recommended.